In a fragile economy, support for the oil sands is not about ethical oil but simple economics. OTTAWA—We have all heard stories about the environmental disaster that is the Alberta oil sands: the toxic tailing ponds, killed flocks of ducks, and massive amounts of greenhouse gases. We have also been told that the oil sands represent the greatest industrial and economic benefit to Canada in a generation: a vast, valuable, and Canadian resource that the huge economies of the United States, China, and India thirst for. An intense debate about the Alberta oil sands has been happening for years now. Those in favour of the oil sands development, like the Canadian Association of Petroleum Producers (CAPP), are running high-profile public relations campaigns to convince Canadians that the oil sands are green and an economic boom to Canada. Ezra Levant’s recently-published book Ethical Oil takes a somewhat different path and argues that oil derived from the oil sands is more ethical than that produced by dictatorial, oppressive regimes in Nigeria, Iran, and Saudi Arabia. On the other side, environmental groups blast the development as an ecological disaster, tearing the earth apart for a resource that is expensive to process. Instead of spending a vast amount of money developing a 20th century resource, Canada should encourage research and investment to develop cleaner, renewable forms of energy. The question is: who is winning this public relations battle? Which issue frame is carrying the day? Issue framing involves developing a narrative about a public policy issue. Since people use mental shortcuts to make sense of the world, the side that can establish a dominant frame, can move and sustain public opinion in their favour. I wanted to assess two issue frames and understand Canadian public opinion on the oil sands development. Abacus Data conducted an online national survey of 1,000 randomly selected Canadians from a panel of over 400,000 Canadians between Oct. 29 and Nov. 1, 2010. The sample was representative of the Canadian population according to age, gender, education, region, and language. Before going into our test of issue frames, we need some context. First, Canadians do not have an overly positive impression of the oil and gas industry. Only one in four Canadians (25 per cent) said they had a favourable impression of the industry, compared with 34 per cent who said they had an unfavourable impression. About one in three (36 per cent) said they had a neutral impression of the industry. Not surprisingly, opinion varied across geographic, demographic, and political groups. Western Canadians, Conservative Party supporters, and older Canadians held more favourable views of the oil and gas industry, while Quebecers, New Democrats, and younger Canadians held a less favourable impression. Second, while attitudes toward the oil and gas industry were mixed, Canadians were more likely to have a favourable impression of the oil sands than an unfavourable impression. More than four in 10 Canadians surveyed said they had either a very favourable (12 per cent) or a somewhat favourable (31 per cent) impression of the oil sands. In contrast, one in four Canadians had an unfavourable impression (16 per cent somewhat unfavourable and 10 per cent very unfavourable). Variation in opinion was similar to that of the oil and gas industry. Finally, we asked Canadians to give us three words they associate with the oil sands in Alberta. Respondents were not prompted and had complete freedom to tell us what came to their mind when they thought about the oil sands. Similar to findings about the oil sand’s favourability, 35 per cent of Canadians identified words that were positive in tone while 35 per cent offered a more negative assessment. About one in 10 Canadians surveyed were more neutral in their description. The word cloud below graphically displays the results of the survey question. Large words in the cloud were more likely to be identified than smaller words. These included “pollution,” “jobs,” “money,” “expensive,” “dirty,” and “economy” and reflect the division in Canada over the project. Overall, those who provided positive associations stressed the economic impact of the oil sands. This included job creation, investment, and tax revenue for government. For many Canadians, the oil sands represent something our country should be proud of, an economic and resource blessing that is somewhat dirty but a necessity. In contrast, those with more negative assessments focused mainly on the environmental damage caused by the development. Most notable is the lack of any mention of terrorism, ethical oil, or oil purchased from unstable countries. The results reflect the division in the country over the issue. While Canadians on a whole were more likely to say that Greenpeace’s argument came closer to their view than Levant’s argument (37 per cent to 21 per cent), there were clear differences of opinion across generational, regional, and political groups. It is also worth noting that about a quarter of Canadians (23 per cent) rejected both statements and felt neither represented their views. Very few Canadians between the ages of 18-29 (15 per cent) said that Levant’s argument came closest to their view. Almost a majority (47 per cent) sided with Greenpeace. In contrast, one in four Canadians 50 years of age and older (25 per cent) sided with Levant while 35 per cent sided with Greenpeace. Geographically, there were few surprises. Quebec residents were far more likely to side with Greenpeace than Ontarians or Western Canadians. Forty-eight percent of Quebec respondents said Statement 2 came closest to their view compared with only 14 per cent who sided with Ezra Levant’s argument. In the West, opinion was more even distributed with 28 per cent siding with Levant and 33 per cent siding with Greenpeace. 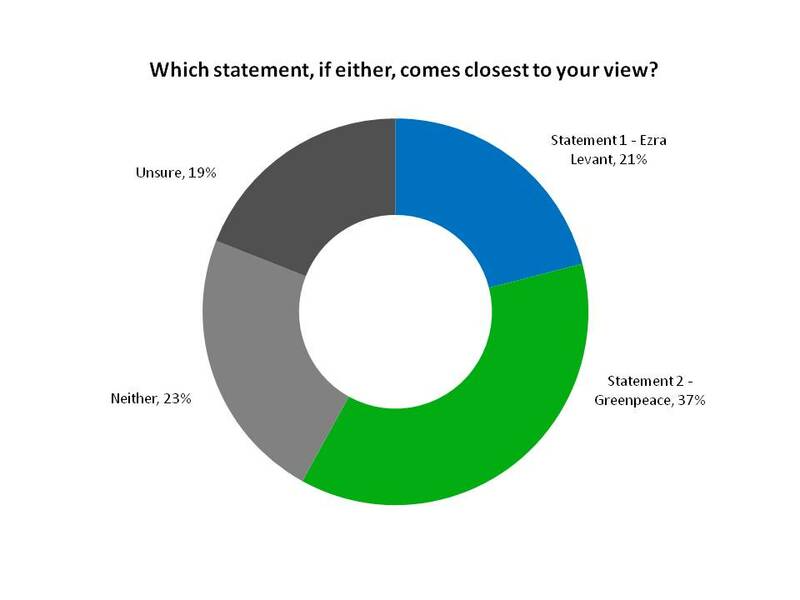 Respondents living in Alberta, home of the oil sands, were the only group who were more likely to side with Levant’s argument than Greenpeace’s demonstrating the importance of the resource to the province. Finally, and perhaps most noteworthy, are the suggested political implications. NDP, Bloc Québécois, and Liberal Party supporters were far more likely to identify with Greenpeace’s position than with Levant’s position. This should not come as a surprise. However, Conservative Party supporters were more divided. Three in 10 Conservative supporters (34 per cent) sided with Levant while another 30 per cent sided with Greenpeace. When it comes to the oil sands and issues surrounding energy and the environment, Conservative supporters do not appear to share a single, monolithic view of the oil sands. This suggests that the Government should tread lightly around the issue and should not buy into Ezra Levant’s argument. The findings from Abacus Data’s National Poll demonstrates that overall, the oil sands are viewed somewhat favourably by Canadians but that many have serious reservations about the environmental damage the development is having in Northern Alberta. The argument made in Ethical Oil does not seem to resonate with many Canadians. Instead, the two opposing issue frames are about the environment and the economic benefit. In a fragile economy, support for the oil sands is not about ethical oil but simple economics. As long as CAPP and the governments of Alberta and Canada frame the issue around jobs and the economy, a large proportion of the country will follow their lead. Dr. David Coletto is CEO of Abacus Data Inc., a public opinion research firm located in Ottawa and a Visiting Fellow at the Arthur Kroeger College of Public Affairs at Carleton University. He received his PhD in Political Science from the University of Calgary.